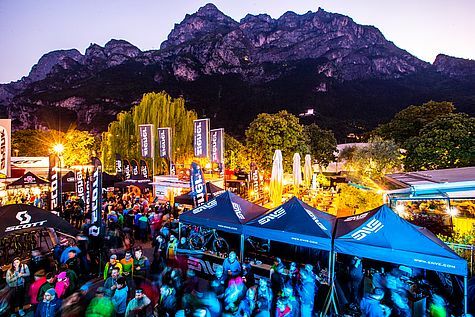 In 2018, the arguably most famous mountain bike outdoor fair – the BIKE Festival Garda Trentino powered by FSA – is celebrating it's 25th anniversary from 28 April to 1 May. And also this year, the huge expo area located right at the shores of Lake Garda will attract once again 40,000 visitors which will get their hands on the latest developments and products for the new season. Time for a chat with Uli Stanciu who started the ball rolling back in 1994. If you would have asked Stanciu 25 years ago, if the BIKE Festival Garda Trentino powered by FSA would still be an annual event with importance to the mountain bike scene, he might have shook his head with a smile; although the initiator of the mother of all mountain bike festivals always was ambitious enough to create something with a longer lifespan. “No matter what I started, if it was the BIKE Magazin, the Transalp or the Festival, I didn't want to come up with a nine day wonder but something sustainable,” explains the MTB icon. Especially as the event weekend had been thought up to intensify the reader magazine relationship. “I originally wanted to to do something for the reader of our magazine which would be more than just a printed paper. I wanted to create an experience, an adventure for them and had no financial interest,” says the former BIKE Magazin Chief Editor. As a result, the meanwhile 70-year-old transferred the existing and successful structures used at the SURF-Festival to mountain biking. What worked well with windsurfing should also do so with the German's latest hobby. The main concept of a fair with free of charge test opportunities of the latest products in combination with some stunning possibilities to go for a ride as well as racing in front of a breathtaking scenery plus the great infrastructure offered at Lake Garda worked out. And has been copied quite a few time ever since. “We actually used the same idea for Willingen only a few years later. But it's nice as only good concepts get copied,” Stanciu says while cross-referencing on copy-cats in Dortmund, Munich or Brixen. And besides the great location also the date done its bit to create an iconic event. Just like in 2018, when the BIKE Festival Garda Trentino powered by FSA and its sold-out expo area brings together fans, riders and brands again to celebrate Europe's season opening. The complete programme of the 25th BIKE Festival Garda Trentino is available online.